It is almost fifteen years to the day when “Pop” Assirati showed me a picture of a 14-year old boy. The boy was lifting the back of Pop’s taxi clear from the ground. “Bertie was powerful then,” said Pop. And I could only gaze in wonder and agree. That March day in 1933 marked the beginning of an association with a most remarkable family and an even more remarkable strong man. I first met Bert in the gymnasium of “The Ring,” that famous London boxing and wrestling arena. I saw a marvel of muscularity before me, gazed in wonder at an enormous pair of triceps, and at length plucked up courage to ask him how he had got that way. Bert, modest and unassuming, told me a little about weight training, invited me to visit his home and take a workout with him, and meet the other members of his family. From that chance meeting I gained a father and a brother, for Bert’s father eventually adopted me as his son, and a friendship with his brother, Joe, which ripened in the years that followed. Both Bert’s father and mother are stronger than average. “Pop,” at 64 years of age, has a mind refreshingly youthful, and a body more vigorous than his years would indicate. Bert’s brother Joe is one of England’s foremost authorities on physical education and body building. Tony, the youngest of the trio, is a famous artists’ model. His likeness appears on many of the buildings in London and on the mural decorating the walls of the transatlantic liners, Queen Mary and “Queen Elizabeth. 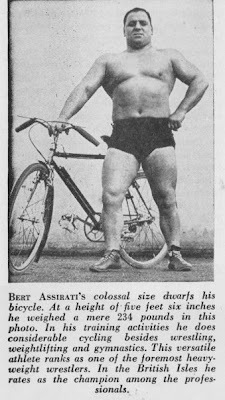 Bert commenced weight training at the age of twelve. The apparatus that he used was his mother’s flat iron. Pop could see that his son had something out of the ordinary with regard to strength and development, so he took him to a local gym and had him taught gymnastics, hand balancing and wrestling. The only weights the gymnasium had were two 56-lb. block weights, crude blocks of iron. By the time he was fourteen Bert was using these for alternate curls and presses, and getting more and more eager as the weeks went by to come to grips with a “real” barbell. On his sixteenth birthday, Pops, as a special treat, took him to a physical culture exhibition. Two of the main acts were Alan P. Mead, famed muscle control artist, and another athlete, scheduled to make an attempt on a strand-pulling world’s record. 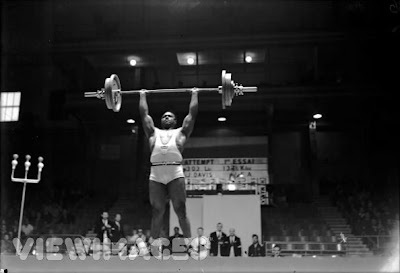 This athlete, whose name I have forgotten, eventually broke the world’s record on the “front chest pull.” Throwing the expander down on the stage, he challenged any member of the audience to duplicate the feat of strength. Bert, with a little prompting from Pop, jumped up on the stage, and performed 15 repetitions with the “world’s record.” The audience called loudly for Bert to strip off; just as our audiences do with the physique champions. Bert did and Alan P. Mead, standing to one side, was so amazed at the development of this youthful Samson that he took him to one side and asked him searching questions regarding his weight training. Five days later, a 225-lb. barbell and dumbell set arrived at Bert’s house, with a note attached from Mead containing a training schedule and his assurance that if he, Bert, trained along the right lines, he would become one of the strongest men in the world. At 17 years of age, Bert commenced his stage career. The act was known as Mello and Nello. Bert’s partner, an ex-circus performer, had taught him all the advanced hand balancing and tumbling feats. Single-arm handstands, front and back somersaults, planches, etc. came easy to Bert, who was the understander in the act. At this time Bert’s weight was 168 lbs. 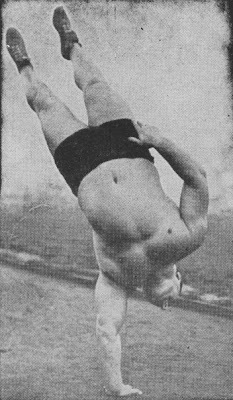 His partner, who weighed 150, and was the topmounter, would kick up into a handstand on Bert’s wrists as Bert lay on the floor. Then Bert would pull him over as in the straight armed pullover. The act traveled all over the world, and in every “port of call” Bert would visit the local body building studio and get busy with the weights. On his return to England, he became associated with a famed old-time strong-man, Bill Bankier, otherwise known as Apollo, the Scottish Hercules. Bert had met Bankier while at a pool and was invited to train at the gymnasium Bankier maintained. Under Apollo’s watchful eye, Bert steadily increased in strength and development. One day George Hackenschmidt, visiting his old friend Bankier, chanced to come into the gym while Bert was working out. Bert, 22 years of age at the time, had just commenced his career as a professional wrestler and was tipping the scale at 200 lbs. He was introduced to the famed “Hack,” and prompted by Hack’s interest, asked him to give him some hints about wrestling. Hackenschmidt’s reply was prophetic for he said, “Forget about wrestling and train for lifting, and you will become the strongest man in the world,” thus echoing the words of Alan P. Mead. Bert did not forsake wrestling as Hack advised, for he shortly became the British heavyweight champion, and subsequently British Empire and European champion. In England Bert has been regarded as the world’s professional heavyweight champion wrestler. Though he concentrated his efforts in wrestling, he did not ignore the advice Hackenschmidt gave him on weightlifting. A considerable portion of his training was devoted to it. Bert continued to progress and he was able to utilize his Herculean strength in performing many outstanding weightlifting feats. The following list of some of his best lifts will serve to demonstrate that he is a superman. These feats were accomplished when Bert was at his heaviest bodyweight. Right hand military press – 160 lbs. Left hand military press – 145. Lateral raise lying – 160 (two 80-lb. dumbells). Tow arm pullover STRAIGHT arms – 200. Two arm pullover STRAIGHT arms – 140 x 17 reps.
Two arm curl – 180. Two arm curl, arms tied to sides – 160. Two hands continental jerk – 380. Two hands clean and jerk – 360. Two hands press – 285. FULL deep knee bend – 550 x 10 reps.
All of these extraordinary lifts were performed in strict style. The two hands curl of 160 lbs. with the arms tied to the sides was inspired by Bert seeing a picture of Matysek back hand curling a thick barbell with the upper arms strapped to the sides. The highest one hand military press, of which I have knowledge, was by a circus strongman named Michael Mayer who performed a right arm military press of 150 lbs. while lashed to a post. Bert was reluctant to have the poundage in the left hand military press published. “Heck, it’s fifteen pounds under right arm record,” he wrote, “so don’t mention it.” With regard to the deep knee bend, which I am quite prepared to have disbelieved, the previous best to my knowledge is the feat of Stanley Sinkiewicz squatting with 500 lbs. for 10 reps at a bodyweight of 190 lbs. To give an idea of the squatting power of Bert, I once saw him squat without cessation for a solid half hour with a barbell originally belonging to Sandow. It weighed 235 lbs. and was used by Sandow in many of his photo poses. To see Bert perform a single arm hand stand, a back somersault or a roman ring crucifix is to be as amazed as if one saw a bull perform the most intricate ballet routine. One simply can not understand how a person of such muscular bulk can be so light on the feet and so supple. Bert Assirati is perhaps he heaviest man to perform a crucifix on the roman rings. He has done this feat even at his heaviest bodyweight of 266 lbs. The only other record I have of this feat being performed by a heavyweight is by a Swiss wrestler named Estelle who weighed 253 ¼ lbs. In dumbell lifting Bert is supreme. Early this year, he was wrestling in the English town of Buxton and as usual sought out the local weightlifting gym. The owner had heard of Bert, and welcomed him saying, “You can have any pair of dumbells you can press from the shoulders.” Bert walked up to the largest pair and cleaning them to his shoulders, pressed them both three times. The dumbells weighed 130 lbs. each! Cleaning them alone is a terrific feat of strength. The enormous power in Assirati’s pectoral muscles can be appreciated by that lying lateral raise of two 80-lb. dumbells, and the straight arm pullover of 200 lbs. No wonder many of his wrestling opponents give up when he clamps a headlock on them. Of recent months Bert has given more and more time to cycling. He has been unable to maintain his severe squat routine which called for the commencement and finish of a workout with 500 lbs. in the deep knee bend for 10 repetitions. He feels that cycling must take the place of squats now that he no longer can devote the time to intensive weight training because of the frequency of his wrestling bouts. So he very often cycles to wherever his wrestling engagements take him. Commencing weight training as a boy, Bert Assirati started a way of life that he has maintained to this day. He believes it to be the best single form of exercise for developing a first class physique and that it is unsurpassed in the development of speed, strength, endurance and suppleness. Bert greatly admires Johnny Davis and hopes to meet him at the Olympic Games in London this summer (1948).